Moving is stressful, there is no question about it. We have done it so many times now – in town, from town to town, country to country, and overseas. Our first moves were rather chaotic, but then I learned how to make it more bearable. Now another move is right before us so it’s time to get started. Even if you are not planning a move in the near future, this is always an important step. And I am not talking about having everything organized, I am talking about having your belongings organized. Do not own things you do not like, use, or find important to keep. If you have too much stuff at any given time, get rid of it, otherwise moving can be a disaster. If you are planning to move sometime soon, this would be the first step. Sell, give away, and throw away what you do not need. This goes along with the first step and is especially important if you are downsizing. There is no need to move everything you own if it does not fit into the new place, or a new garage, or a new basement. The plan does not have to be fancy, just a good idea of what space is available and what fits in there. I normally make a simple drawing on a graphing paper. This way I know where we can put what and what fits and what does not. Packing up the whole house can be overwhelming. By starting early and setting small goals it is not so difficult. If you pack just three boxes a day, in 10 days you have packed 30 boxes, in 20 days 60, and in 30 days 90 boxes! Sure, you can’t pack everything away a month before the big move, but there is always something that can go into a box long before the move. Here are some things that you can start with: books, garden stuff, special dishes, guest room bedding, etc. Depending on how long before I pack the box and how long till I know I will be able to unpack, I label more or less. But one important label always has to be on the box: what room it belongs in. Unpacking is so much easier if you have every box and furniture already in the right room you want it to be in. Especially if there are many helpers on a moving day, things can be very rushed. To have a plan (see point 2), and labels can help enormously for a smooth move and quick settling in. A reader shared with us: One of my favorite things is colored duct tape. Each room gets a different color. When you arrive, put a piece of tape on the floor in front of the door to the appropriate room. Movers- family-friends-whatever- now know what room each box goes into. What a great idea! If you move as a family, let the move be a family affair. Our kids had to pack their own rooms starting at a very young age. Sure, at first we helped them, but they also learned to have responsibility and how to pack and move a room. Since I am at home way more than my husband is I do most of the packing, but still, the garage and his tools are his responsibility. If you know of someone who could help you with the task, ask for help. No one has to do the whole move alone, or at least should not. There are seldom times where everything has to be moved in one go. If it’s possible, have the fragile things out of the way before the big move. If you have access to the new place a few days earlier for cleaning, take your glass table, picture frames, and house plants with you and they will not be in the way on a moving day. Post redirection takes time anyway, so why not do it early. As soon as you know your new address, make all the address changes you know you will need to make. After the move, you will be tired and still busy settling in so it is nice not to be worrying about paperwork. 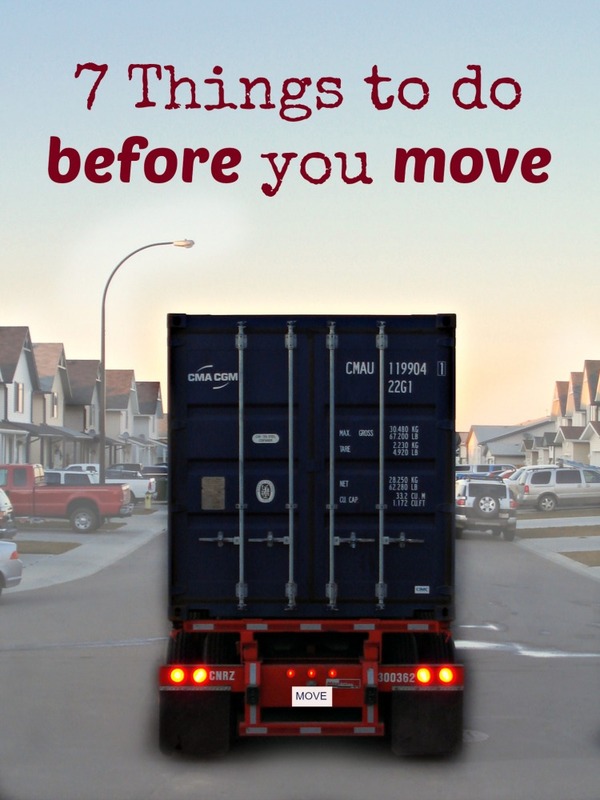 I hope these 7 simple steps are helpful to make the moving experience as pleasant as possible. It still will be a lot of work, but not as overwhelming anymore. Is there anything you would add to the list? Thank you! Yes, moving is stressful! I will be happy when it is over one more time. My most daunting is step one. I’m pretty sure about half of the bulk in my hose now is NOT going with me. I have actually worked on this over the past few years, taking carloads to the thrift shop or dumping boxes in the recycle or dumpster. It has only recently occurred to me that this insight/task should always be on my mind with EVERY NEW PURCHASE. Step one is important even without a move. And you are so right, we need to think about it before purchasing things. I hear you, one of our hardest moves was into a place next door. We hardly had any help, because well we just had to carry everything next door, but it still IS EVERYTHING! I always start off great. Lots of nicely labeled and organized boxes….then the couple days before the truck arrives I am throwing handfuls of things into boxes labeled with words like miscellaneous or “stuff” 🙂 Good luck on your move! Thank you! At least you start organized ;), the rest happens to the best. Being organized is key!!! Moving is never fun, but it makes it much better when you have planned and prepared! Great tips thanks! This is a great blog entry! The other thing I would add is taking detailed pictures of the rooms of the new space so you can start to visualize everything about your plan so your timeline is a reality in your brain first! Great tip! I actually did that for our last move, very helpful! Thank you! Great advice! We’ve had 14 addresses in 22 years,so I’m never moving again. The last time we moved my oldest son (in high school at the time) decided that since I make such a big deal about every box being labeled on all sides, everyone would label their boxes. So, he didn’t label his thinking that all unlabeled boxes were his. He didn’t tell anyone this and when box after box came in the new house unlabeled I sent them up to the attic. It was pretty stressful! Never moving again sounds good to me! Oh my, your son will probably remember for the rest of his life to label boxes. Glad you find it helpful. have fun (as much as it is possoble) packing. A tip I see recommended over and over on military pages is to use colored tape upon the boxes, and then on the door frames of specific rooms. Also, wheeled suitcases make great moving tools for heavy things like books. Although not directly related to boxing and carrying your belongs, my tip is this: when possible, paint before you fill the rooms. It’s ever so much easier to paint when there is nothing in the room! Once things are there, the focus becomes unpacking and decorating gets set aside. That is a great tip, thank you for sharing.